Integrate 2 telephone numbers in 1 mobile. 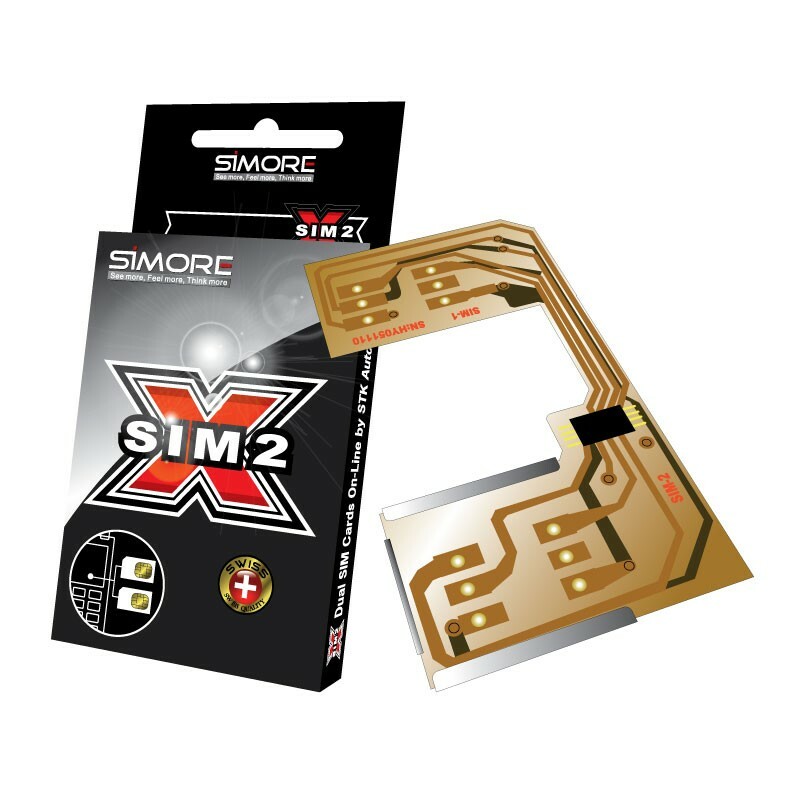 Simore DualSim Black type 2 adapter is an intelligent device that allows you to install two SIM cards in one mobile phone. Dual SIM card adapter Black 2 is installed directly into the slot of your SIM card. Once inserted into your mobile, the Simore menu will automatically appear in the menu of your phone. It allows you to manage your two numbers and to define all your settings. You swap from one number to the other in two steps. The DualSim Black type 2 version does not require cutting the sim cards (see videos). No need to cut the SIM cards. Switch between your professional and private life. Can I receive calls on both SIM cards at the same time with the X-T, DualSim 3G and DualSim 2G adapters? The current mobile phones are equipped with one transmitter and one receiver, thus they can not simultaneously connect two SIM cards on two different networks. If you are connected on SIM-1 and someone calls on SIM-2, the caller will reach your box and may leave a message. However, you can activate the automatic function (not available for all adapters) that allows you to switch between your two SIM cards with ease. Example: 1 hour 35 minutes on SIM 1 and 5 minutes on SIM 2. Note: the automatic function is not supported by all mobile phones. If you need both SIM cards active at the same time, we recommend you the Bluetooth simultaneous adapters. I'm scared of cutting my SIM card. Is this risky? The Simore dual SIM card system - type 1 model - is universal. It is understandable that you may be apprehensive when cutting your SIM card, however please note that under no circumstances can you damage the functionality or lose data on your SIM card, providing you follow carefully our installation instructions. Please see the video. Our system is reversible. We provide in every pack two recovery tools that enable you to restore your SIM cards to their original form and place each of them into two separate phones. Please see the video. For professional and accurate cutting of your SIM cards, you can purchase our cutting clip. (Reserved for models Black, Silver and Gold only). Warning: the clip is not suitable to cut the DualSim Platinum and Infinite models. After cutting your own SIM card, how can you return it to its original form? What is the default PIN and PUK for SIMore Silver, Gold, Platinum and Infinite? What is the shortcut key? The "shortcut" allows you to switch from one SIM to another or to get to the SIMore menu by simply dialing a code. Warning: the shortcut key is for the SIMore Platinum and Infinite versions only and is not supported by all mobile phones. What is the IP Phone Call? This function requires the services of an operator who is a provider of VoIP via a local access number. You can use this IP call for all international calls. This feature allows you to call abroad at a low cost from your mobile and save up to 70% on all your international calls. When a call is IP, SIMore connects first to your VoIP server, via a local access number, then the server connects you to the number you are calling. The SIMore "IP call" entire procedure is fully automated. Choose the contact number in your phonebook. 100% of your calls are redirected to your VoIP server. SIMore recognizes the star placed in front of the number and automatically forwards the call to your VoIP server. What is the encrypted SMS function? The encrypted SMS allows you to send and receive confidential information via encrypted SMS. To exchange encrypted SMS, users must have a Gold, Platinum or Infinite SIMore and agree in advance an encryption key. SMS will be encrypted and decrypted using the encryption key agreed between the users. On receipt of an encrypted SMS, the message that appears will contain special characters that will become clear only after decrypting the message. What is the Secret Agenda? Your notes are confidentially and securely stored in the SIMore internal memory. Access to the SIMore secret agenda is protected by a password (4 digits that you can modify at any time). What is the Secret Directory Service ? "The Secret Directory" allows you to store and call your confidential contacts (Names and Phone numbers) safely. Your contacts are confidentially and securely stored in the SIMore internal memory. Access to the SIMore Secret directory is protected by a password (4 digits that you can modify at anytime).